I for-one love doughnuts but they don't love me. Where I live we really don't have an amazing doughnut shop that's within a 20 mile radius and don't run out before I wake up (I normally wake up when a lot of doughnut shops close). To me it didn't look that big until I received it. They do not joke around when they say its KING size. 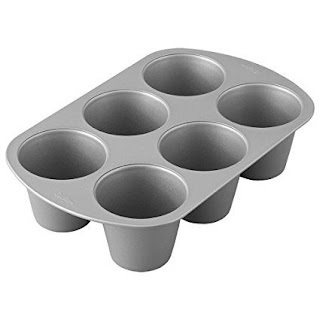 Its about twice the size of a regular muffin pan. Today I had a little help from my 6 year old niece, Kayleigh, who came to spend the night. She loved helping me making the doughnut muffins and really loved them as well so they are kid-approved (those are the little hands you might see in a couple of pictures). Why I chose Saigon Cinnamon instead of regular Cinnamon? I personally think it has more of a cinnamon flavor like a cinnamon stick and is sweeter. It can be a little pricier than regular cinnamon. Specialty stores have it on sale or Amazon has it for reasonable price its worth the try. Sorry if the videos are small and might not be clear. 1. )Microwave 1 stick (1/2 cup) of butter in 30 second intervals until completely melted. Let it cool slightly. 2. )Whisk together sugar, dark brown sugar, oil and cooled melted butter. Add baking powder, baking soda and sea salt. Mix well. 3. )Sift in flour two cups at a time. 4. )Add eggs and buttermilk. Whisk together then add in milk. 5. )Whisk in cinnamon, nutmeg, and ginger only two to three times. 6. )Cover and chill for 1 hour. While the batter is chilling combine vanilla bean scrapping from two vanilla beans with sugar, either whisk or break up the vanilla bean seeds with fingers. For cinnamon sugar, combine sugar and cinnamon stir gently. Preheat oven to 350 degrees. Spray muffin tins with nonstick cooking spray. With an ice cream scooper or piping bag using a ziplock bag, fill cups 2/3 full. Bake for 15 to 20 minutes if using the regular muffin tin or 25 to 30 minutes if using the King Size pan. Melt 1 and 1/2 sticks (3/4 cups) of butter, let it cool slightly. Dip one doughnut muffin in melted butter, coat the muffin well using a rolling and brush method then roll muffin in either the vanilla bean sugar or cinnamon sugar well. Warning: They are really delicious and you might eat them all in one sitting. Donut Muffins sound amazing! Two of my favorite guilty pleasures combined into one. I am def going to try to make these with my kids! Thanks for sharing the recipe! You are so welcome. I hope you enjoy them. These look so delicious! I've got to try this! They are worth the try. These look SO good, and not terribly difficult to make. I'm going to veganize them! They are easy to make even for kids can make them. I was going to add that you can use vegan butter or coconut oil but forgot. I bet your kitchen smells amazing after baking these..what a mash up! My kitchen did smell amazing. She did help me clean up. She was all about helping me. HUBBA HUBBAAAA!!!! That sugar crust-dusting has me weak in the knees! Damn it. Now I am sitting at my desk craving doughnuts! That sounds like a great idea for Christmas. Oh, this looks so tasty! I definitely need to try this recipe. It's been too long since I've had a doughnut! It has been a while for me a well and this is better. Umm....these look amazing! My family would eat them all in a day I'm sure. Thanks for sharing. You are welcome. I hope y'all enjoy. These look and sound so scrumptious, I cannot wait to try! These are divine. I bet your niece had a blast helping. Love that you shared this experience with her. She defiantly did. She cannot wait to help me again with a different recipe. Wow! These look delicious! Thanks for sharing the recipe. I think my daughter would love these. They look so yummy! Thanks for sharing. I've been craving donuts like crazy these past couple of days! I'm definitely going to make these because they look so good! I could just eat everything on your blog!!! Looks so good!